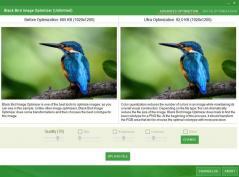 Black Bird Image Optimizer FREE is a free application designed to optimize photos with lossless quality. The application can significantly reduce the size of your photos while preserving their initial quality thanks to the built-in color quantization algorithms. Black Bird Image Optimizer FREE will optimize images without using their metadata information. To detect the best colortype for PNG files, the program will perform several trials. At the beginning of the trials, the program will convert the RGB area which allows it to accurately select the optimal colortype.